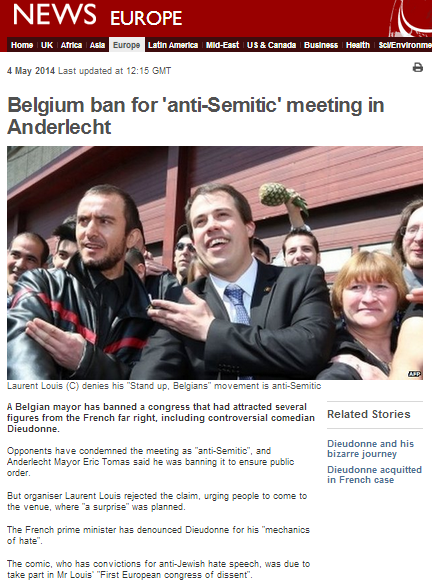 On May 4th the Europe page of the BBC News website featured an article with the interestingly punctuated title of “Belgium ban for ‘anti-Semitic’ meeting in Anderlecht“. That choice of punctuation is of course BBC code for ‘some people say it’s antisemitic but we’re not sure’. The report relates to the cancelling by the Belgian authorities of a proposed convention, promoted as the “First European Congress of Dissent”, in Anderlecht, Belgium. The event, which was organized by Belgian MP Laurent Louis, was supposed to have included appearances by several figures from the French far-right, including – as the BBC article notes – Dieudonne M’bala M’bala and Alain Sorel, whom the BBC forgot to mention despite having promoted him on Newsnight and Radio 4 as recently as four months ago. The BBC article includes repetitions of its now five month-old tepid portrayal of the ‘quenelle’ gesture, even devoting a side-box to the topic with a link to an article which was already problematic when first published last December. Notably, whilst quoting the Football Association (not exactly the most qualified authority one could choose to quote on the subject of antisemitism), the BBC continues to ignore the views of professionals who specialise in the topic. 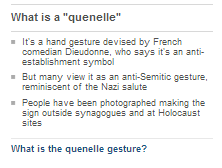 “Described as an inverted Nazi salute, the quenelle is claimed by Dieudonne to be an anti-establishment symbol. The BBC report ‘balances’ its reporting of statements made by Belgian officials and an anti-racist organization on the subject of the convention by quoting a Facebook post from its organiser. However, the BBC refrains from informing audiences that Louis’ repeated use of the quenelle is just the tip of the iceberg of his history of antisemtism and extremism, which includes making that gesture in the Belgian parliament, Holocaust denial and analogies and accusing Zionists of having “set up and financed” the Holocaust. 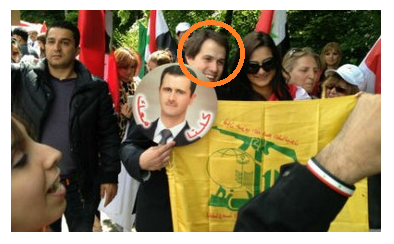 Last year Louis was photographed at a pro-Assad rally trampling an Israeli flag and holding a portrait of Bashar al Assad and a Hizballah flag, telling Syrian TV that “Europe is being used in the conflict [against Syria] as a tool in the hands of Israel, the rogue state”. So, once again, the BBC whitewashes and downplays the antisemitism of European extremists and continues to promote to BBC audiences the notion that an antisemitic gesture might actually be something else. Not only is it abundantly clear that this policy fails to meet the BBC’s obligation to “[e]nable individuals to participate in the global debate on significant international issues”, but it is also remarkable that with regard to antisemitism specifically, the BBC appears to be extraordinarily and inexplicably reluctant to accept the principle that the targets of such racism should play any part in defining it. Someone tell the BBC that the quenelle is really pro-Israeli. It will then send out a flurry of articles condemning it. No, it isn’t. It’s BBC code for ‘We don’t think there is such a thing as antisemitism. Some people simply – and with good reason – can’t stand those bloody Joooos’.